Sometimes known as a serpentine belt, power steering belt, alternator belt, or A/C belt, the accessory drive belt, simply put, is a belt that drives the accessories bolted onto the outside of your engine. These are often critical to the running condition of your vehicle, so it is important to keep an eye on the condition of your belts and replace them when they show signs of cracking or delamination. If you wait for your belt to break, the alternator will stop charging, the power steering will fail, as well as the vital water pump in many cases, leaving you on the side of the road. Occasionally multiple belts will be offered for your car depending on accessories installed, so be aware shorter belts are often for cars without A/C. Founded in 1871 Continental has grown to become one of the largest automotive parts manufacturers as well as leading OE suppliers in the world. As a leader in OE quality power transmission technology Continental integrates cutting edge materials technology into every component brought to market. Utilizing progressive materials such as Kevlar, fiberglass and polyester reinforced EPDM and HSN compounds Contitech belts and belt kits offer unmatched longevity and performance to the consumer. 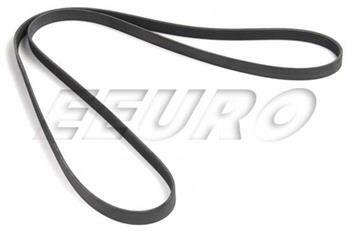 If this is not the exact Accessory Drive Belt (6K 2415) (Short Belt) you are looking for, or you would like this part in a brand other than Continental, please contact us and one of our customer service experts will help you locate the exact part you need. eEuroparts.com® proudly offers wholesale prices and fast shipping available on most orders. We also provide inexpensive and guaranteed 3 day, 2 day, and Overnight shipping options, so if you need your Accessory Drive Belt (6K 2415) (Short Belt) tomorrow, eEuroparts.com® can deliver! Every eEuroparts.com® order is track-able, meaning you'll know exactly where your Accessory Drive Belt (6K 2415) (Short Belt) is at every step of the shipping process. eEuroparts.com® also displays your Expected Ship Date and transit time in your Cart, making our entire shipping process simple and transparent.